A new friend, DJ, made these delicious biscotti for the cookie swap and they are amazing with a nice hot cup of coffee, tea or hot chocolate! Blend dry ingredients well. In small bowl whisk together espresso, milk, egg yolk, vanilla; add to dry flour mixture. Combine until dough is formed (a very dry, thick dough.) 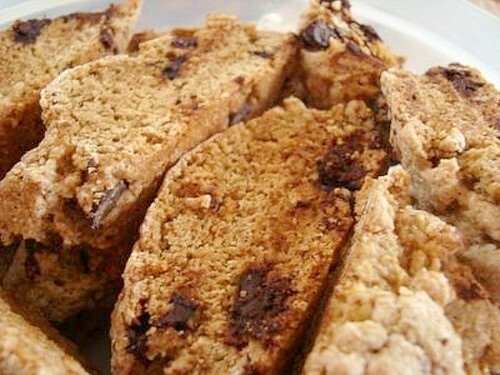 Stir in nuts and chocolate chips if desired. Turn dough onto lighty floured surface. Knead several times and halve it. Roll dough into two (2) logs approximately 12" x 2" dia. Transfer to non-stick baking sheet and arrange 3" apart to allow for spreading. Flatten logs a bit with palms. Bake 35" at 350 degrees. Score (diagonally) and cool 10" (NOTE: I find it best to cut all the way through before they harden too much.) Reduce oven temperature to 300 degrees. Cut logs diagonally into 3/4" slices. Bake 5" more on each side. Cool completely. Store in airtight container. 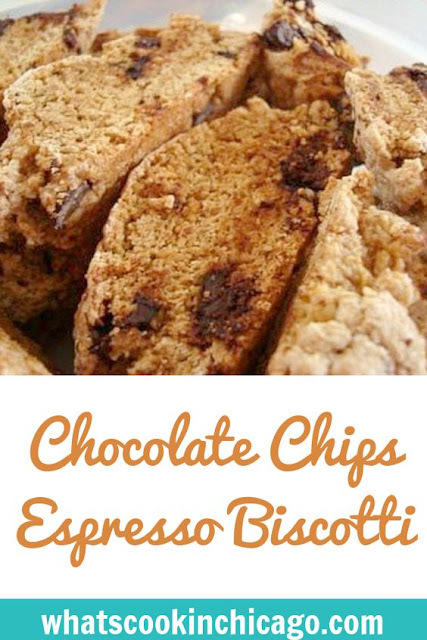 Makes approximately 24 biscotti cookies.